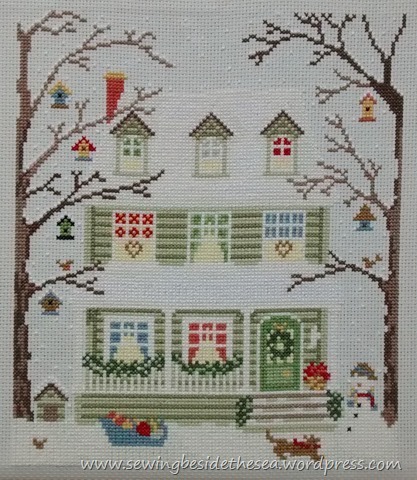 New England House – Winter etc. Just a quickie to show you what I’ve been up to over the last few weeks. 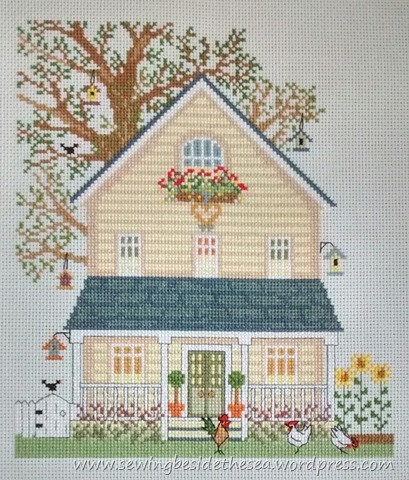 It’s the fourth New England House by Bothy Threads. 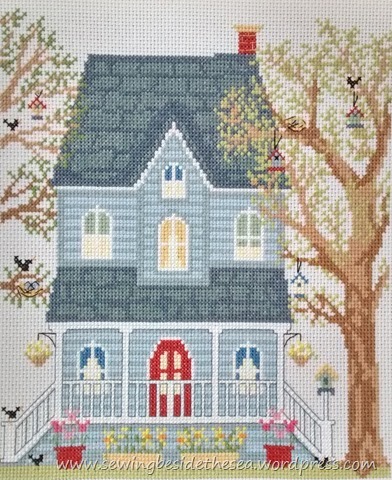 Their kits are a dream to stitch. I found working with the three different shades of white quite challenging but it was worth it. First page done… Second page… Third… Fourth… … and finally, the backstitching and beads. I’m really pleased with how Winter has turned out. The photos don’t do it justice because the snow has a bit of icy sparkle and there’s beads in the door wreath and on the garlands. I’ve really enjoyed stitching this set. Here are the others in case you missed them earlier. They are all being gifted to my sister. She loved the first one so much that I simply had to complete the set. I was supposed to be stitching them, one for each year but I couldn’t help myself. What next I wonder? Will I return to the ABC Bears or something completely different? Maybe I should get on with the SAL project first or something new from the stash. I love to start new projects. So much choice! Avis the Winter one is so lovely. 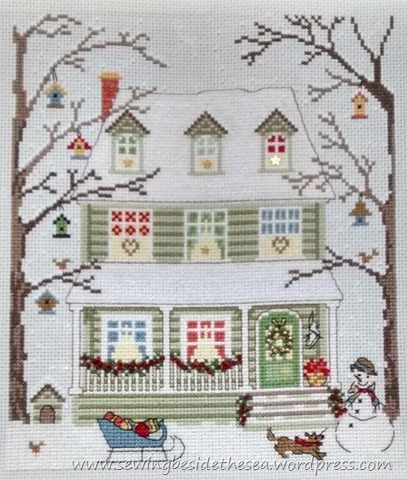 I love the snow on the roof and it is so clear when back stitched. Your sister will be thrilled.. Thank you. The back stitch makes all the difference doesn’t it? They’ve been so much fun to stitch and they’re on 14 count so easy on the eyes as well. oh well done Avis! 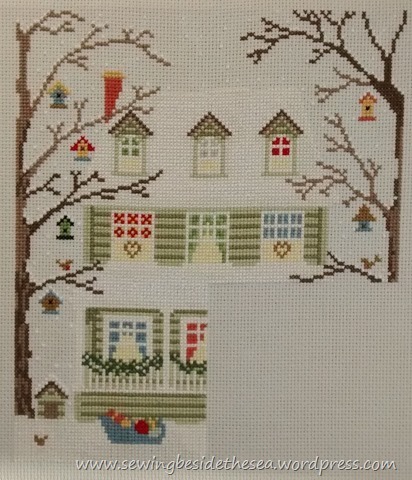 Gosh the Winter house must have been quite difficult to stitch with all those light colours on white, but the result is spectacular. I love the détails with the snowman and all the embellishments. Have to say, I think my favourite house is Summer because of the chooks lol. It was tough, especially with the sparkly white. I think Summer is my favourite as well. Me too. I didn’t notice it until I put the photo into the post. I’ll show them again when she’s got them in the frames. These are so beautiful, and you really had to persevere on Winter, but it is really spectacular with the beads and back stitching…WOW! Thank you Kathy. Once I’d finished a couple of them I couldn’t stop myself and had to do them all. Just gorgeous! Your perservance and efforts really show up, particularly in Winter. I only wish the sparkly thread showed up on the photos. Adorable. Your sister is a lucky lady! Thank you. 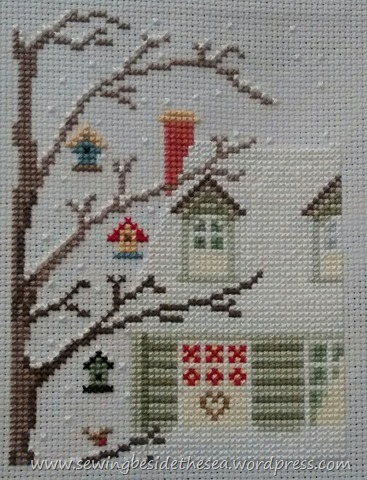 I really enjoyed stitching them. I love all of them for different reasons but I think if I had to pick a favourite it would be the winter one. Fantastic work Avis everything that you do is very neat and precise. I am very lucky to be receiving these and I am planning to show them all together in my new house. Thank you very much. You have a very lucky sister! They are such a beautiful set and will look lovely together. I bet the sparkle in the snow really adds the wow factor to winter! I know haha! The sparkle is so pretty. It’s a very fine strand stitched at the same time as two strands of normal floss. Thank you. They were fun to stitch. Beautiful work Avis , I would be cross eyed trying work with the light colours. 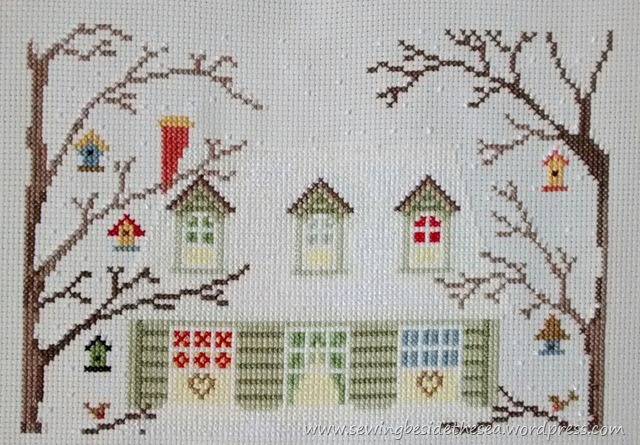 You stitch up wonderful cross stitch projects :). Thanks! It was a challenge but worth doing I think. All of the seasons are lovely. And you stitched them up pretty quick! Great job! I’m sure your sister will enjoy them for years to come. The stitching was at the expense of my patchwork. I can’t seem to get around to that these days. Yep, Winter seems to be a favourite here. That’s very true. Now that you’ve said that I think this series might have been even better if it showed the same house in different seasons. However, I suppose they might have been boring to stitch. 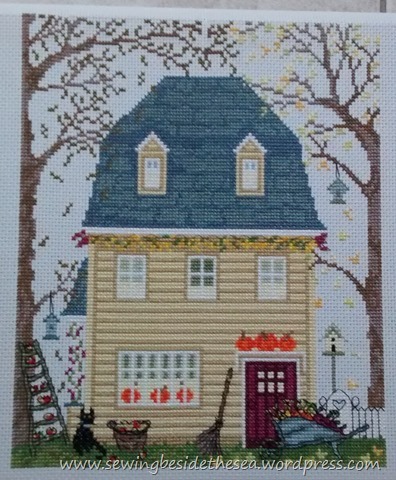 Love, Love, Love these New England houses! 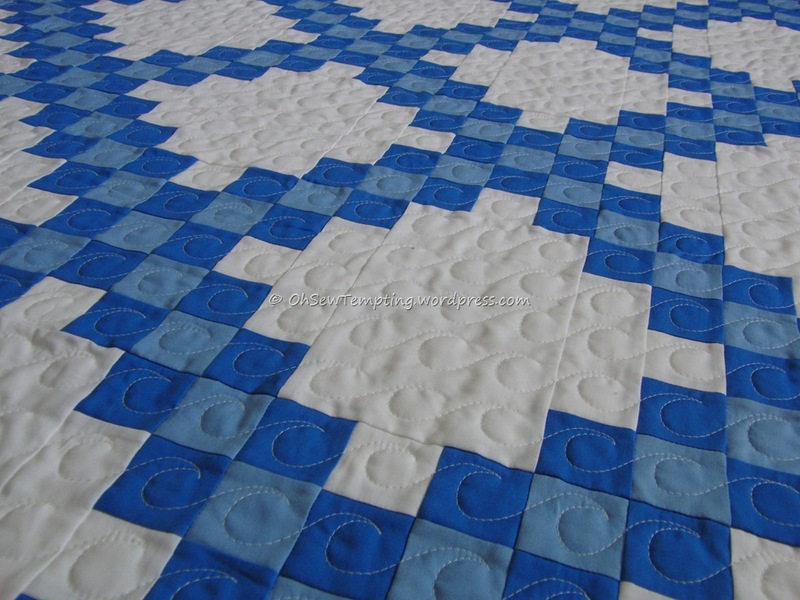 And once again it’s amazing what the back stitching does to a piece to finish it off. Thank you. They were so easy to stitch. I wish the set was even bigger. they are beautiful! I think Winter is my favourite. I think you should show us your stash and let us decide what you should work on! Thank you. Actually, I’d be embarrassed to show you my stash. There must be at least a dozen kits waiting to be started! I’ve gone back to ABC Bears and won’t start anything else until it’s finished.